A Pox against Dementia; the Fear of Forgetting. Home → Blog → A ‘POX ‘ ON DEMENTIA! I’m sure I am not the only Baby Boomer to hope that a vaccine against Alzheimer’s will be developed before my alarming short-term memory loss blossoms into full blown dementia. Meanwhile, I practice spelling ‘world’ backwards, and counting down from 100 in multiples of 7. Doctors use these exercises to determine cognitive ability. Did you know that? Mind you, I guess that to cheat the test by rehearsal would only be cheating myself. Nor are they the only determinate. Recently my elderly neighbour managed to pass the 7’s test (albeit with difficulty). However, she was caught out when she was unable to grasp that our village of Blackheath is located in the Blue Mountains. Ironically, although the names of acquaintances escape me with embarrassing frequency, my first experience of vaccination remains vivid. Compulsory smallpox vaccination was an eagerly anticipated rite of passage for young Aussies heading overseas in the nineteen sixties and seventies. We cheerfully rolled up our sleeves and wore our disfiguring scars like badges of honour. My older sister was disappointed when her arm failed to produce the slightest pimple. She was told this was because she had already been exposed to cowpox; legacy of being raised on a Tasmanian dairy farm. Few outside the medical profession would be aware that the word vaccination derives from the Latin vacca, for cow. It is a reminder that a bovine virus led to the discovery of vaccination as a protection against disease; initially smallpox. 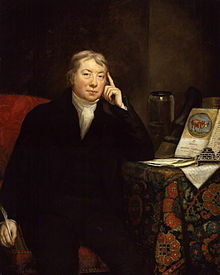 The connection between smallpox and the relatively harmless cowpox virus was made in the eighteenth century by Edward Jenner, a country doctor from Gloucestershire. Jenner had noticed that many local dairy maids emerged unscathed from smallpox epidemics. In 1796 he extracted fluid from a pustule on the hand of milkmaid Sarah Nelmes, then introduced the virus to 8 year old James Phipps via a simple scratch. The little boy experienced only a mild fever. When his experiment with what became known as ‘vaccination’ proved a success, Jenner established a free clinic for local people. Not everyone supported him. An anti -vaccination society sprang up, and a satirical cartoon was circulated showing patients sprouting cow-like growths. It is interesting to reflect that there is still a strong anti-vaccine brigade in society today. Perhaps any reservations will dissolve as the projected epidemic of dementia takes effect. It is less widely known that a Dorset dairy farmer by the name of Benjamin Jesty had already experimented with vaccination some twenty years earlier. During an outbreak of smallpox in 1774, Jesty innoculated his wife and two sons with matter drawn from the udder of an infected cow. Jesty himself was already immune due to his close contact with the herd. He was widely criticized for this action at the time, but later his contribution to public health was recognized and he was awarded a gold medal. Having identified our great-great-grandmother as Martha Guppy, a dairymaid from Dorset, I am beginning to think that my sister’s failed vaccination had as much to do with genes as visits to our cowshed. 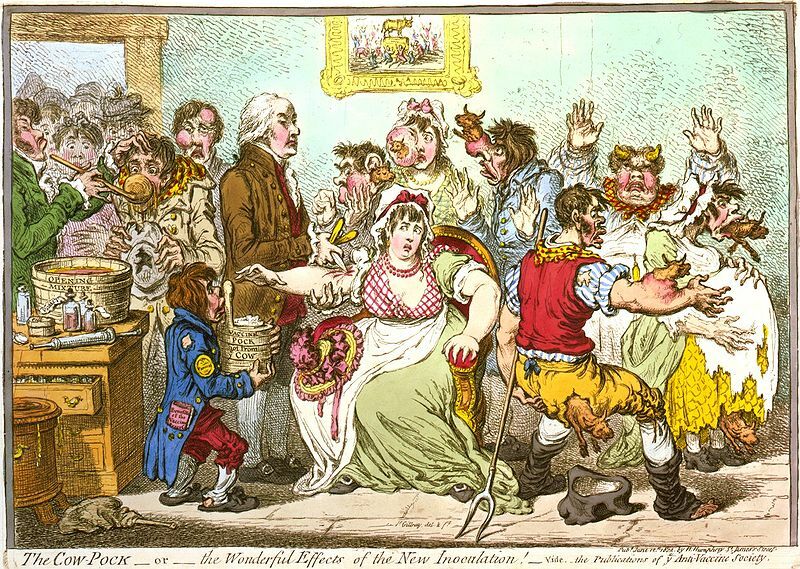 A scar on my arm proves innoculation worked in my own case, but we may have inherited a resistance to smallpox from Martha, along with rather solid ankles! Whether she suffered from dementia is of course, unknown. The poor soul probably died far too young for it to develop. After reading an article about research into a vaccine against Alzheimer’s I forwarded it to my sister. Faced with the prospect of marrying a local farmer and becoming a fifth generation dairymaid, she left home at seventeen to train as a nurse. She was later employed as a recreational therapist in a dementia unit. As a fellow Baby Boomer, she is no doubt watching scientific developments with both professional and personal interest! It could be said that dementia and Alzheimer’s are the modern day scourges of society, just as smallpox was in the past. NOTE – Dementia now touches almost every family, including my own…… Jean’s Story. Pauline, a vaccine would be wonderful. My Nan suffered with dementia and now my beautiful Mum. It breaks my heart to watch her struggle with the anxiety that the early stages of dementia brings. My Dad is a wonderful man and I can see the mpact it is having on him too. Oh dear Mardi, how awful for you all. Poor Jeannie is in a constant sate of anxiety. She is still very aware of her memory loss and it must be terrifying. Very interesting Pauline. I must be well into the first stages by now; I couldn’t do either of those things. I think they should make the tasks a bit easier, Josie.